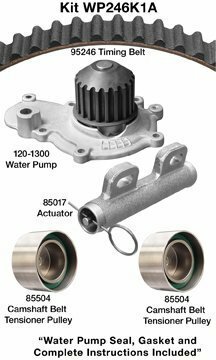 Dayco Water Pump Kit w/o SealsFeatures: Designed for the replacement of worn or damaged timing belts tensioners belt idlers hydraulic actuators and water pumps Meets or exceeds OE quality fit form and function requirements Provides consistent slip-proof power transfer for peak engine performance Ensures proper tensioning guiding and precise valve timing Exact replacement for easy installation Includes timing belt balance shaft belt tensioner(s) pulley(s) hydraulic actuator(s) water pump with gasket springs and hardware when applicable and trilingual installation instructions Ensures peak long-lasting performanceDayco Timing Belt Water Pump Kits are manufactured to meet the critical OE quality fit form and function requirements demanded by both domestic and imported vehicle manufacturers to ensure long lasting peak performance. This Kit contains application specific instructions and extended warranty options. Kit with outboard bearing support Fits Softail 1990/2006-by-Belt Drives Ltd.